For low magnification observation, the device utilizes the 25 mm lens. Linear zooming allows magnification adjustments between 6 and 25x. When more magnification is desired, the flip of a switch shifts the light path from one lens to the other. With the 100 mm objective lens, zooming capabilities increase to 25-100x magnification. The enormous light gathering capability of the 100mm lens creates a bright and clear picture in nearly all viewing conditions, including twilight. In accordance to Yukon Advanced Optics' tradition, the Yukon 100x's design provides the user both power, quality and comfort. To prevent viewing fatigue or discomfort, a specially designed adjustable 45-degree, rotating eyepiece is utilized to suit the viewer's comfort from any angle, even when lying on the ground. Both digital and photo camera adapters are available to be used with Yukon 100x.The unit accommodates both photographic and spotting scope tripods and can double as a telescope for late night stargazing. - The high quality optics is guarded by a durable composite body. The scope’s body is surprisingly lightweight and compact, making it easy to transport. 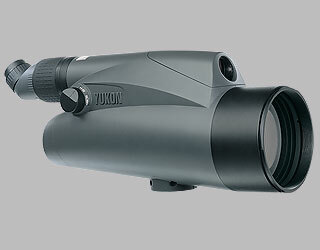 - Yukon 6-100x100 delivers crystal-clear magnification from 6x to 100x with no distortion or loss of image quality. Yukon's engineers have achieved this exclusive capability by using two multi-coated objective lenses, one with a 25mm aperture and the other with a 100 mm aperture. Both lenses share a common ocular lens, which allows for a smooth transition as the viewer adjusts the scope to the desired magnification.